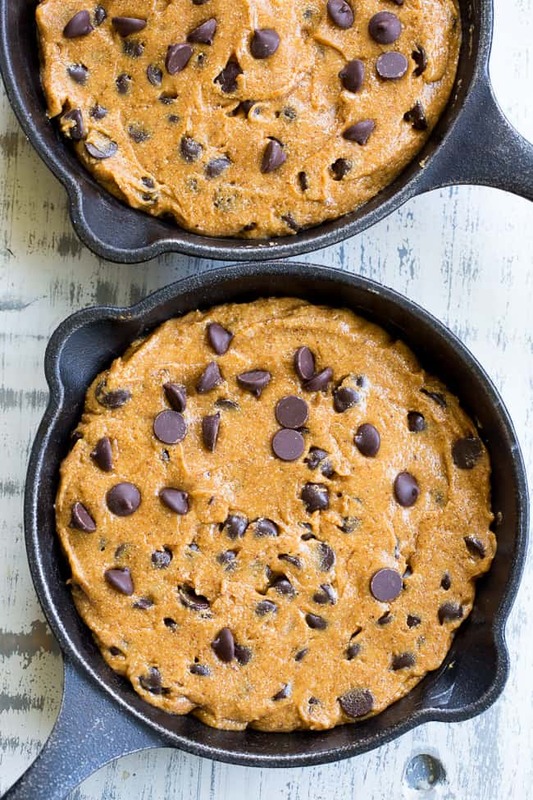 This fudgy paleo chocolate chip skillet cookie is loaded with good stuff! Almond butter and coconut oil give it chewy moist and fudgy texture and it’s sweetened with raw honey and unrefined coconut sugar. A combination of coconut and arrowroot flour keep it grain free and gluten free! 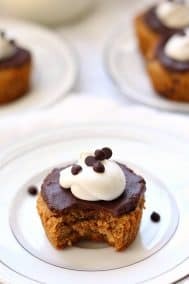 It’s packed with dark chocolate chips and perfect topped with a big scoop of coconut vanilla ice cream. 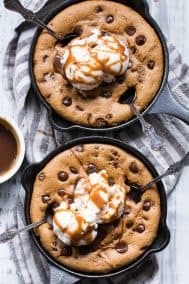 Since it’s almost Mother’s Day, I’m sharing a dessert that is my own personal favorite to make, serve, and devour – a fudgy, gooey chocolate chips skillet cookie! 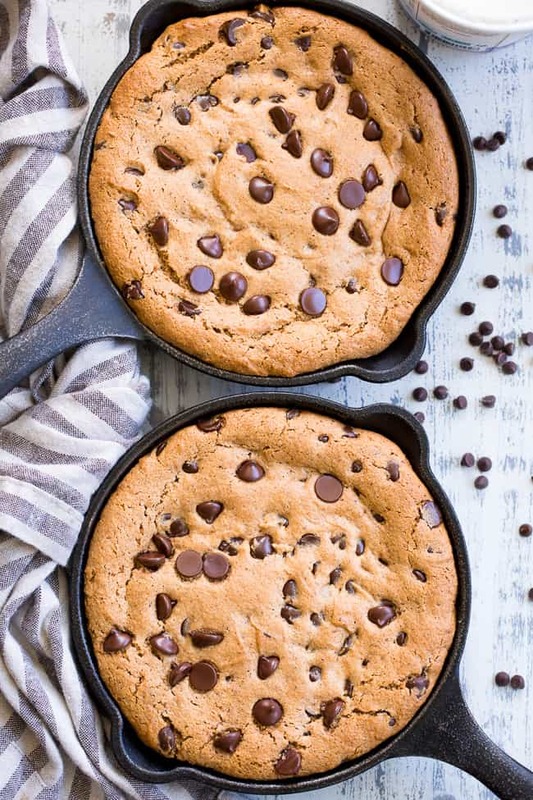 I’m a total sucker for skillet cookies and the fudgier and gooier, the better! 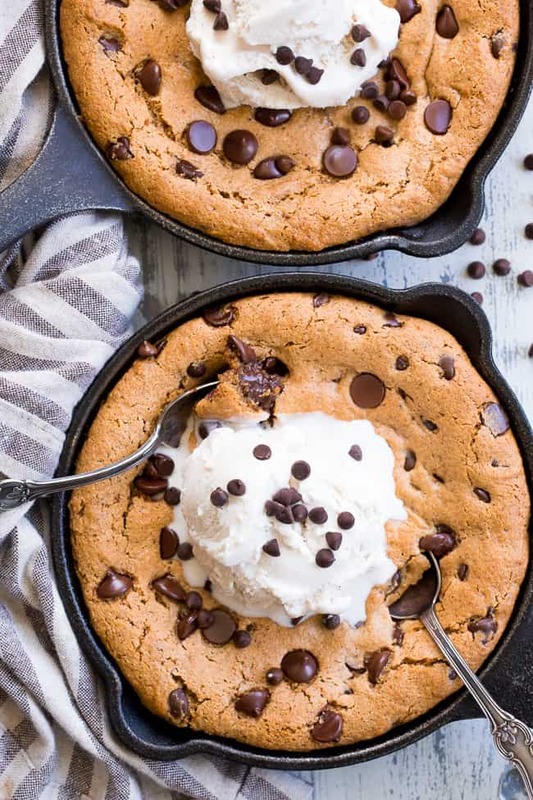 Whether it’s my original coconut oil skillet cookie, fudgy chocolate skillet cake, snickerdoodle apple pie skillet cookie, or gingerbread chocolate chip skillet cookie, a good skillet cookie is my go-to dessert when I want something perfectly satisfying. For this one, I decided to go the coconut flour route. I tend to shy away from coconut flour when it comes to cookies, since it can be a bit tricky to work with when you want to get a really gooey, fudgy texture. I’ve found through trial and error that nut butters seem to be the key to making a coconut flour cookie (or skillet cookie) truly amazing! I also think coconut flour cookies work best with a combination of liquid and granulated sweeteners. This is just my opinion based on personal experience – no science behind this one. I decided to use a combination of coconut sugar and raw honey and man – the gooey sweet factor is just off the charts! I loaded the dough up with tons of dark chocolate chips to make it ultra gooey, fudgy, and chocolatey. You can use dairy free, soy free chips (linked in the recipe below) OR make your own chocolate chunks if you want something without any refined sugar at all. You can use the recipe for paleo chocolate in my post for chocolate chip cookie dough truffles. 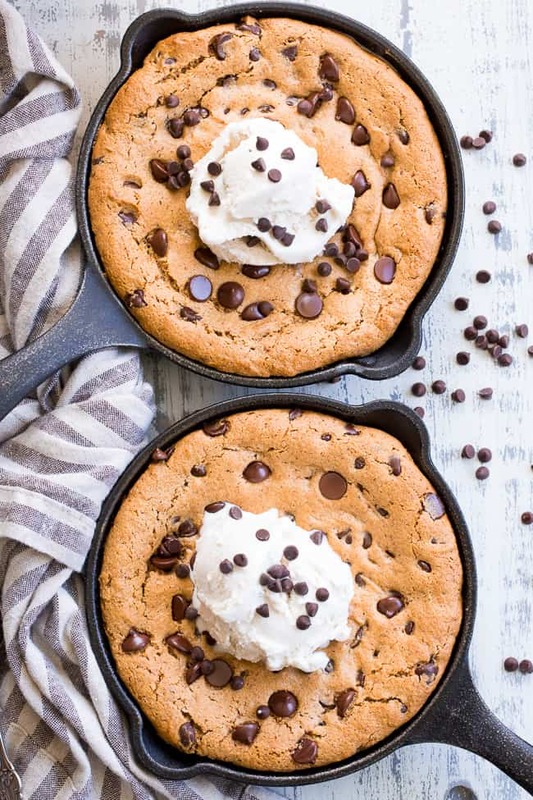 The thing I LOVE about skillet cookies (well, besides just that they exist!) is that you don’t have to chill the dough so it’s scoopable, nor do you have to wait for them to cool! I love digging in when they’re warm with tons of melty chocolate. Oh, and of course after topping with a big scoop of coconut vanilla ice cream! But then, we dig in! 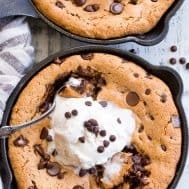 I love making these skillet cookies when my family comes over because they’re always a total crowd pleaser for everyone, no matter what sort of diet they normally follow. They’re also kid approved and non-paleo-eater approved every single time! Also, if you want to go completely wild, you can make some paleo salted caramel sauce to drizzle over the cookie and ice cream. 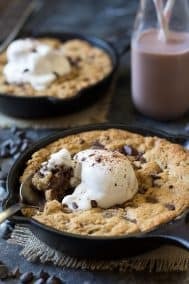 Happy Mother’s Day to all the incredible mommas out there – make yourself this paleo chocolate chip skillet cookie ASAP – even if you’re reading this months away from Mother’s Day 🙂 Enjoy! 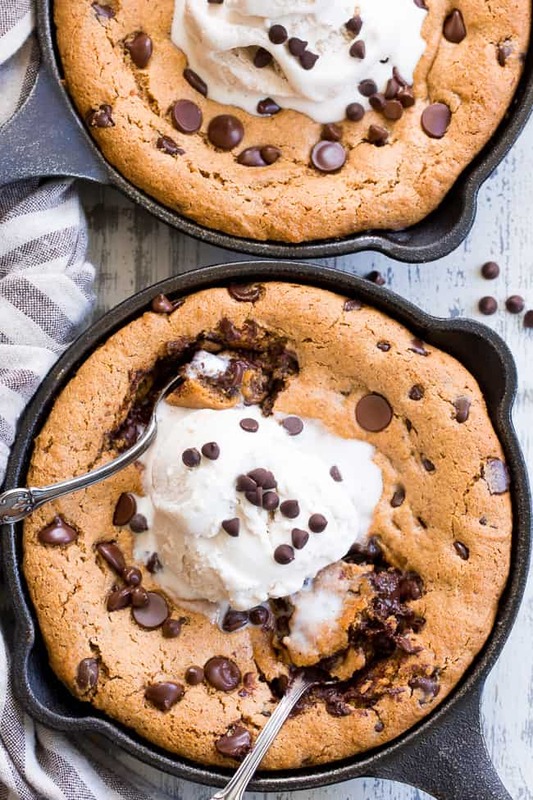 This fudgy paleo chocolate chip skillet cookie is loaded with good stuff! Almond butter and coconut oil give it chewy moist and fudgy texture and it's sweetened with raw honey and unrefined coconut sugar. A combination of coconut and arrowroot flour keep it grain free and gluten free! It's packed with dark chocolate chips and perfect topped with a big scoop of coconut vanilla ice cream. In a large bowl with an electric mixer, combine the egg and egg yolk, coconut sugar and honey until smooth. Add in the almond butter, coconut oil and vanilla and continue to mix on medium speed until smooth. In a separate bowl, combine the coconut flour, arrowroot flour, baking soda, and salt. Add the dry mixture to the wet until a thick, sticky dough forms, then stir in the chocolate chips, leaving a small handful to sprinkle over the top before baking. Bake in the preheated oven until sides puff up and middle is just set, about 14 minutes for 2 small skillets and 15-17 for one large, do not overbake, watch for signs that they’re done! Serve warm with coconut vanilla ice cream if desired. Enjoy! I used enjoy life dark chocolate morsels. Alternately, you can make your own paleo chocolate using the chocolate part of this truffle recipe. 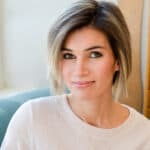 I love your website and recipes. Some of us are trying to reduce our sugar content. Too many of your recipes are desserts. Does your family eat a lot of sweets in a week? Most inflammatory diseases require reduction of all forms of sugar. 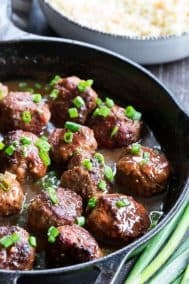 Would love it if you shared more of your dinner recipes as it is a challenge finding a good variety of paleo dinner recipes (with little to no sugar.) 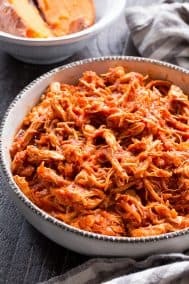 BTW your chipotle lime chicken is amazing!!!! Can you use liquid coconut oil? 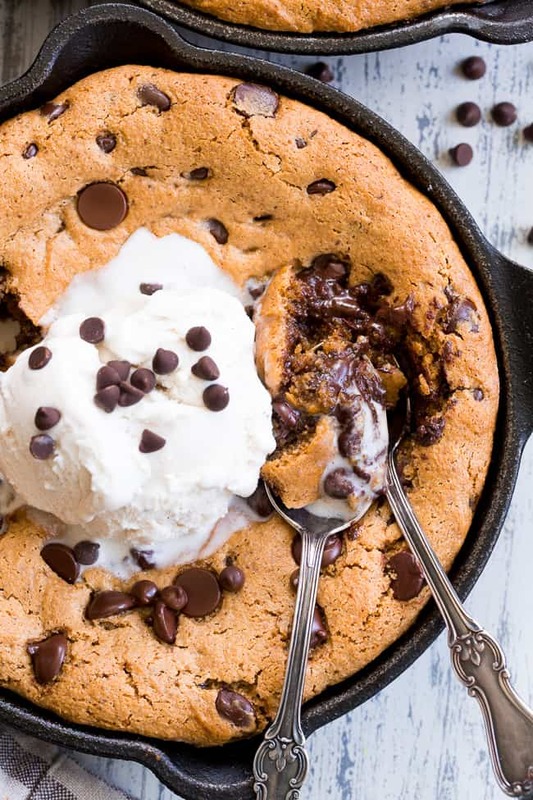 Oh my, I wish I had this giant chocolate chip cookie near me right now – looks amazing! 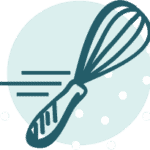 Recently become crazy about coconut flour, but it ruined all my favorite baking recipes!!! Lol. Ha! Great for snack, dessert, anytime! I made the cookie for desert for Mother’s Day — everyone would enjoy it again. Almond butter is expensive so I tried making my version. My end result was not smooth — but tasty. 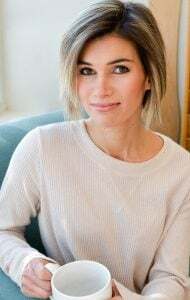 I also am requesting more recipes without sugar — I enjoy your recipes and would like to see more with lower sugar content. 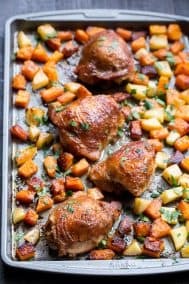 I attempted this one on Saturday and realized after 2 minutes in the oven that I forgot to mix in the dry ingredients!! I had put them together in a bowl off to the side and completely forgot about them. I took the skillet out of the oven and mixed them back in. At that point most of the chocolate chips had melted and I was sure I had ruined it but it actually came out great! It was more like a double chocolate cookie skillet than chocolate chip but still tasted amazing! I’m going to attempt again and make sure to get it right this time lol. Thanks for all your great recipes Michele! So glad it worked out!! Let me start by saying that your website is my favorite! 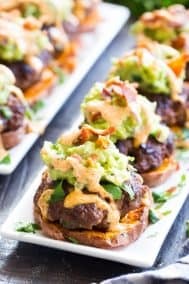 i probably try 2 of your recipes a week! So yummy! I replaced the coconut oil with extra almond butter. I also used a 10 inch skillet and needed to bake it for 17 minutes. Really great texture. 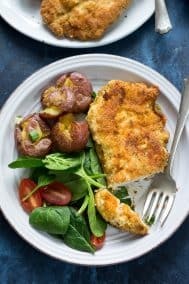 I have been experimenting with coconut flour, so I am happy to have found this recipe!